Done for Art Evolved. Just a quick pencil drawing and color job, nothing too fancy. There is a little dinosaur in the water about to become lunch for a much larger ichthysaur called Cymbospondylus from the late Triassic. I think these things got to around 30 feet. Wow Brett, its your first marine reptile here? Its awesome, the mother of all itchyosaurs. 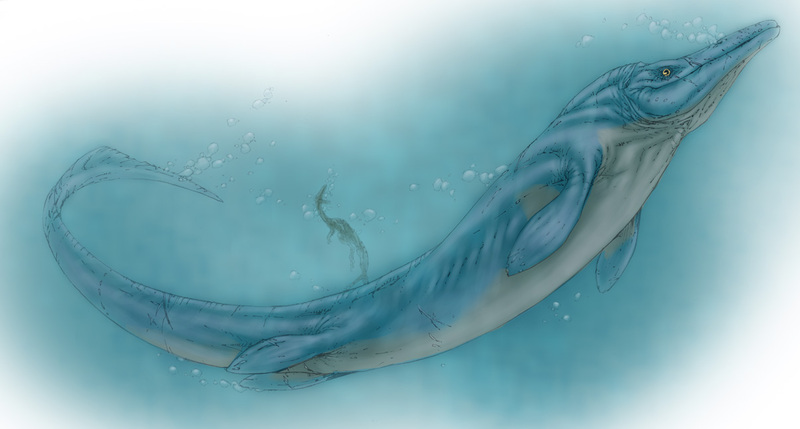 Actually the third, the first is a very small plesiosaur with Eusreptospondylus, and the second I believe is with a swimming Suchomimus. This would be the 4th one I've ever actually drawn. Saw your work on Art Evolved. This is a great piece, nice work! Now on a completely different tone. Remember the '80s and all those bakkerian/paulian "Coelophysis" kayentakatae dressed as a eagles (or chickens, it depends on the eye of the beholder)? Now I think it's time to put (again) some true proto-feathers on triassic critters (i.e. ornithodirans and dinosauriformes: proto-proto-dinosaurs)...Me and Andrea Cau were caught in the middle of a conversation via blogs when this paper came out: Brusatte, S. L., Nesbitt, S. J., Irmis, R. B., Butler, R. J., Benton, M. J., and M. A. Norell. 2010. The origin and early radiation of dinosaurs. Earth Science Reviews. Early online. doi: 10.1016/j.earscirev.2010.04.001; pp. 22-23 are especially interesting, IMHO. For proto-feathered ur-prosauropods (yes!) take a look: "Expect the Unexpected..." on "Geomythologica". I'm just wondering at what size we should draw the line for feathered or scaled? Is it randomly distributed or did only certain lines loose the feathers? I guess feathered should be the fall back position now? Too many questions and not enough answers! I like how the Coelophysis is in the water simply going "Holy sh**! "lol As always, your art is awesome.